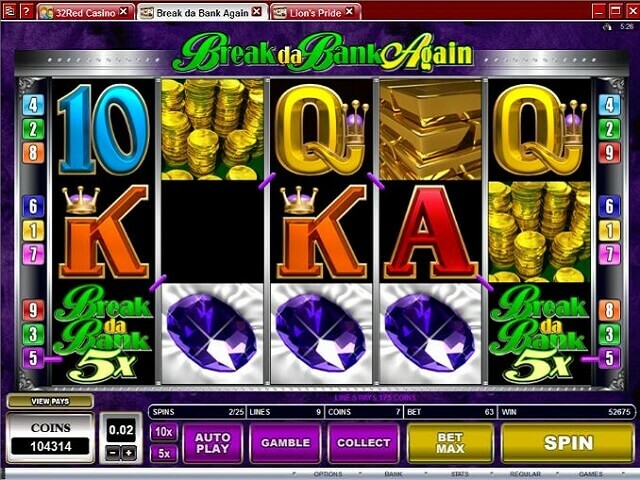 Break da Bank is one of the most popular pokie machines that online casinos have offered for many years. 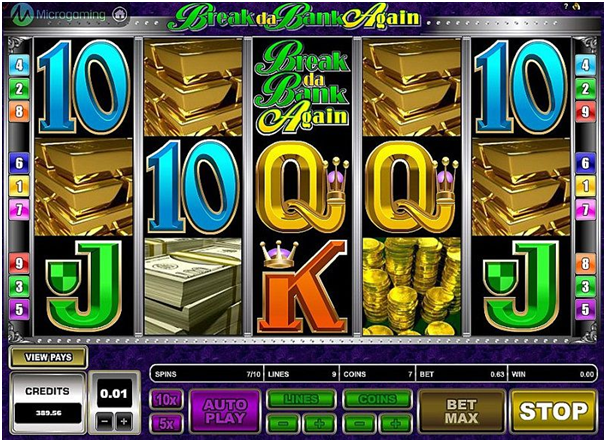 If you see Break Da Bank Again at your favorite online casino for Mac devices, you will be glad that they have improved on the original. Instead of the 3 reels that you get to see with the original machine, the new version from Microgaming is a 5 reel, p line pokie machine. 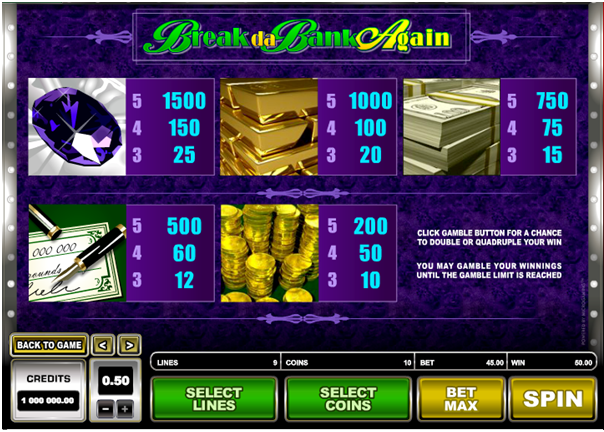 It offers more chances to win and improved graphics over the original Break Da Bank. When you use a Mac computer device to play this game, you will get to see the exciting action in a smooth and convenient manner. 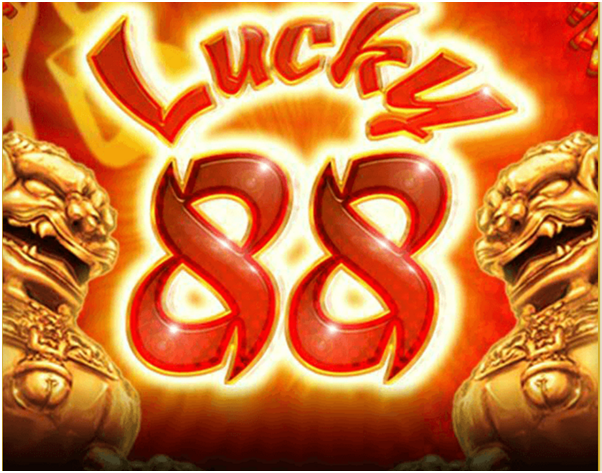 It combines all of the ways to win with top notch graphics and the high quality software that Microgaming is known for. Besides the traditional symbols for cards that range from 9 to ace, there are also some great symbols that represent the theme of the game. Gold coins, gold bullion, jewels, check books and a gold pen all make you want to win the jackpot for this machine. The Break Da Bank logo is the wild symbol and the bank vault is the scatter symbol. The graphics for the nine pay lines make it easy to figure out when you are a winner and it is also easy to know how much you have in your bank and how much you are betting. The special features of this game are also sure to catch your attention. Graphics are nice and thanks to your Mac device, you will enjoy them, but the thing that will keep you playing this game is the chance to win. The wild symbol not only replaces any other symbol, it also acts as a multiplier. That multiplier can range from 5X to 25X depending on how many are on your winning line. Another favorite feature of pokie machines is the free spin feature and Break Da Bank Again does not disappoint. 3 of the scatter symbols will trigger the free spins. 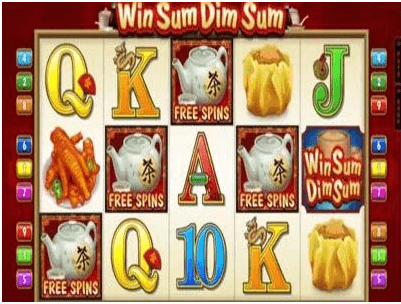 You can receive between 15 and 25 free spins depending on how many scatter symbols you are able to get. 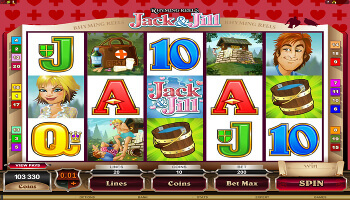 Another favorite feature for pokie machines is the gamble feature. When you win you will have the opportunity to increase your winnings by trying to choose whether the card will be red or black. If you guess right, you will win. This feature will allow you to gamble up to 5 times. It is a great way to hit really big with Break Da Bank Again.